We have seen a nice big house with alot more space and nearer to the school. On Saturday morning my husband has a meeting with the owner and he will show the place. I really hope so badly that we can get the house! Has anybody moved with their cats? Is there anything special to watch out by the cats when moving to a new place? Ps please hold your thumbs that we get the place We would finally have space for a cat wheel ! The only thing I can think of is that you need to keep them indoors for at least a couple of weeks until they settle otherwise they could try and find their old home. If your cats are outdoor cats then you should carefully consider the surrounding area and it's dangers, but if they are indoor cats then nothing I can think of. 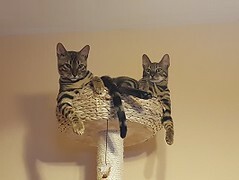 I have moved 3 times with my two bengals, I always keep them in the bedroom for the first couple days, then give them their freedom, but you'll figure out what is right for your cat based on their behaviour. We've moved with cats many times. The biggest thing is to make sure they're safe from escaping while you move. So if you can empty one room in your existing home and keep them in there with a litter box and food & water while you actually move everything that will be safest. The other option is to take them to the new house first and put them in a secure room there while you move. We've had to do it both ways in the past. In the new house it's a good idea to use a "safe room" for a couple of days so they can get used to the smells and sounds of the house. I've never let the cats outside so not much help there but looks like you got some good advice about that above. *fingers crossed* that you get the place! Donna offered the perfect advice. Make sure your cats are contained while loading up the furniture and the best way is to clear out a room and put them in there with food, water, litter box, their favorite bed, etc. Do not allow anyone to enter that room as long as the exterior doors are open. If you are moving locally, you can do it a couple of different ways. You can keep your cats in your current house until you are completely moved in or you can move the cats once you have a room ready for them at the new house. The key is there will be a lot of noise and commotion with the move and you do not want your kitties to get scared and run. So, making it easier on them is the best way. It will take them some time to get used to a new home. I'd get a couple of Feliway diffusers if you don't already have them and plug them in the new house. It may help them settle in. I have no idea how long it might take you to move. Many people do it in a day! It's great you're planning ahead even if you do not already have the new house -- "be prepared" is a great motto! I'll keep my fingers crossed for you. I'm moving house tomorrow. In an hour I will be taking both cats to the cat resort up the road, where they can stay for 3 nights. That way they're not around for the moving part, and I can set up the new place fairly well before I introduce them to it. They have been a bit funny about the packing and proliferation of boxes, but they're doing okay (probably better than me). Alex in particular likes to climb on all the boxes. I moved the boys with me for a year, from our condo in Florida to a one bedroom apartment in backwoods Louisiana. They never really went outside at either place, but loved the balcony in LA. I just made sure I spent a few days just running errands and coming home after short periods of time before I went to work. And indulged their separation anxiety. It was a small enough place that they got comfortable pretty quickly. Just offer lots of cuddles, encourage them to come with you when you leave a room if they're scared. They adapted back home like nothing, ha ha. Thank you all for the great tips! I let my two girls outside because we live in an area where there arent many cars driving around and we have a nice garden with lawn. The new house will have a huge back yard. So i will have to keep them inside for a couple of weeks. Would it be a good idea to take them for walks on the leash, or do they have to stay inside so they know where the new home is? If you allow your cats outside -- this becomes a huge issue when you move. I can't tell you how many dogs and cats have gone missing from a recent move. Right now, your kitties have their scent around their territory. In a new location, they have no idea north from south, east from west, and there is no scent laid down that they can relate to! Keeping them inside is not going to allow them to lay a scent down outside. If you plan to let them outside, I would definitely start with a harness and leash. This will allow them to put a scent around the perimeter of their home. Cats will expand their territory over time. The one thing that you said which intrigued me was that you have very little car traffic. How many cars does it take to run over a cat? ONE! If you have only one car coming down the street, that's a danger. And how many owners have run over their own cat? It has happened!!!! Personally, with a larger house, it may be better to keep them indoors or have an area in the garden that can contain them. I think we can all learn a lesson from Clare's experience with Hendrix. It had a happy ending, but without Clare's detective work and Clare and Jon's diligence over a couple of weeks, Hendrix would still be a lost kitty. I guess it depends on the cat. The moggie I had before had a bad luck to be involved in moving house three times in just over two years. Once it was just 3 mins down the road, twice it was 600km or more. After each move it was the cat that would be most scared and least interested in exploring its new surrounding, so no danger of him escaping. He would build up his confidence and his territory from one single corner of a room. And he was a cat that was used to go out as he pleased. Also, each time we moved he was more confident and it took less time for him to adapt to his new surroundings. As usual, I think it depends on the particular cat and caution is always advised. Thank you Sherry you are totally right! Hubby and I decided yesterday that we will only take them out on a leash. The reason why is first for safety and secondly because our neighbors have alot of birds and the owner told us he thinks the birds are acting weird since Lili is always around there. So I think its best to start going out on the leash again. But I can only take one cat at a time. I tried taking both once and it was not good. We got all tangled around a tree and I had to ask someone for help. I would never forgive myself if one or both of them would get run over by a car or go missing! Ps. They have only been free to walk around since about three weeks. You can always get a pet stroller and put them in there and roll them down the street! Seriously! They have them and people do walk their pets that way. They don't get much exercise, but they do get the fresh air. Ironically, when I walk Raiden on a leash, the black and white kitty (if he sees us) will walk right along side of us the entire way. He does visit some yards, but always catches up to us. It's so funny. The neighbors think it is hysterical. Walking a cat takes time out of your day -- our walk this morning was over an hour and there is another one looming this afternoon -- and we have snow on the ground. I can only imagine trying to walk TWO of them on leashes! One at a time will take longer. I still think you might check out some portable enclosures that you can set up in your yard -- or even construct something that can be easily taken down if it needs to be. I know how much Raiden enjoys the fresh air and being able to walk places, but there is no way I can allow him to do that on his own. He doesn't use his enclosure much in the winter time even with a heated bed out there. You want to keep your babies safe from harms way. Thank you all for crossing fingers..We got the house!!! We are all happy and abit nervous. But I am so happy we will have more space and I hope our cats will also enjoy more space. We are moving on the 1 of May! Congratulations!!!!! I know you will ALL be happy in your new home.